My guess is that most of you who call Good Shepherd your church home did not choose this congregation based upon the fact that the ELCA, to which this congregation belongs, meets every other year for something called a Churchwide Assembly. I know that wasn’t the slightest reason why my family and I started worshiping here more than a decade ago. I offer a word of thanksgiving to each of you who do call Good Shepherd your church home today. I recently returned from the 2011 Churchwide Assembly of the Evangelical Lutheran Church in America. I was one of six musicians from across this church who were invited to provide music & worship leadership during the assembly. It was a blessing to serve in this capacity as the ELCA, which consists of more than 10,000 congregations and 4 million members, met in Orlando, FL. The ELCA met to dream, to plan, and to experience the ways in which God is active in this church. I would not have been able to be part of this leadership team without your prayer, encouragement, and financial support. Thank you. That’s all fine and good, but you may be asking what does the ELCA’s Churchwide Assembly and the 16th chapter of Matthew’s gospel have to do with one another. Well – quite a bit, actually. In the few verses before today’s gospel, Peter confesses who Jesus is when Peter says to Jesus, “You are the Messiah, the Son of the living God.” This is one of the most significant confessions of belief in who Jesus is, in the entire New Testament. The image in your bulletin (or screen) is a huge tapestry that hung in the main lobby of the convention center where the Churchwide Assembly was meeting. Freed in Christ to Serve gave focus to our gathering. It’s a theme of belief, of doing, and of remembering that Jesus is leading. I didn’t know much about Churchwide Assemblies before I left Bismarck. My first thought was that the voting membership would be quite boring and largely be led by Robert’s Rules of Order and parliamentary procedure. Their work would be grounded in order and rules, rather than what God may be doing in the church. Granted there are rules and regulations at the assembly. There are approximately 1,000 voting members who have been elected to attend the Churchwide Assembly by their Synod. Every one of these voting members actively participates in the ministry of a local ELCA congregation. But way more profound than the organization and structure and rules, is the almost overwhelming presence of God. The voting members would adjourn their meeting in the middle of the day so that all assembly participants could gather around Word and Sacrament in worship and celebration of Holy Communion. 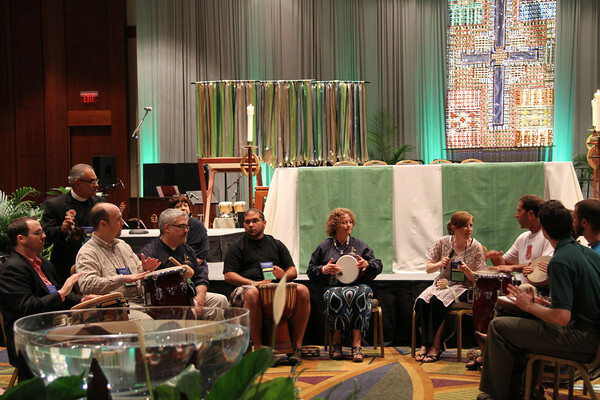 Outside of worship, prayers are shared in the middle of busy hotel hallways, stories of faith are celebrated on couches in lobbies, and hopes and dreams for God’s future mission of the ELCA are explored over a turkey sandwich that is shared during afternoon lunch break. The ELCA’s Biennial Churchwide Assembly is far less about rules and order and far more about trying to follow where Jesus is leading. I want to highlight three initiatives that came out of the assembly where I felt Jesus leading. There is information on these initiatives on a table in the Narthex or on the ELCA’s website. First, the ELCA Malaria Campaign officially launched. Over the next four years, the ELCA will seek to raise $15 million dollars for treatment, prevention, and education in an effort to eradicate malaria in several sub-Saharan African nations. Malaria claims more than 800,000 lives each year. A tragic number of lives given the treatable nature of Malaria. I’m excited to see how Good Shepherd will take an active role in the Malaria campaign over the next several years. Second, the assembly approved the 11th Social Statement of the ELCA. This one called Genetics, Faith and Responsibility. Social Statements are teaching and policy documents, that assist the ELCA in reaching informed judgments on social issues from a faith perspective. And third, the assembly approved the results of the LIFT Task Force, or Living into the Future Together. The LIFT Task Force has been and will continue to ask two very significant questions to every ELCA congregation, and every brother or sister in Christ who calls one of these congregations their church home. What is God calling this church to be and do in the future? And, what changes are in order to help us respond most faithfully? I think Pastor Megordan is right. To believe in Jesus doesn’t insolate us or give us a free ticket to ignore the suffering that exists in our own lives, in our neighborhoods, or in other parts of the world. To follow Jesus is also not about doing an endless list of things expecting that God will love us more if we do them. To follow Jesus is a believing and doing journey. 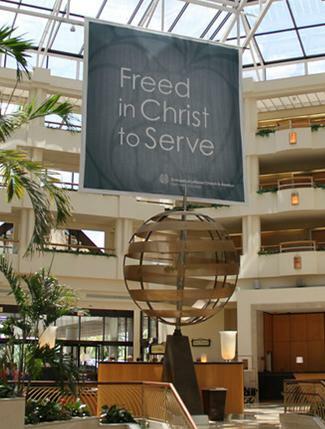 Freed in Christ to Serve is how the 2011 Churchwide Assembly of the Evangelical Lutheran Church in America sought to follow Jesus. I think the greatest challenge that I’ve worried about since returning is this. The Malaria Campaign, the latest ELCA Social Statement, or the LIFT Task Force can all come to a very abrupt and quiet ending today if we forget who is leading. I hope and pray that won’t be the case. You and I are freed in Christ to serve – to believe and do as we follow this savior named Jesus. May Christ richly bless and keep us as you and I get out of the way and let Jesus lead. Amen. This entry was posted on Monday, August 29th, 2011 at 10:39 pm	and posted in Recent Sermons. You can follow any responses to this entry through the RSS 2.0 feed.